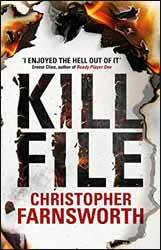 Kill File (2016. 323 pages) is a stunningly enjoyable thriller from the pen of Christopher Farnsworth. One would think that having a real psychic as your main character would limit the scope of the story; after all if he can read your mind, implant thoughts and visual hallucinations, then surely he’s near indestructible. John Smith is hard to kill, but he is not without his own Achilles heel. For a start most minds are cluttered with garbage and Smith has to endure a 24 hr drone of the stuff from all the people around him. Secondly, if he inflicts harm on others that he connected to he feels a lot of what they are feeling, including being stuck in the head of someone who is dying. Lastly, although he can effect small, short term changes, his targets always revert to their underlying personalities. Not so obvious about the character is that he has a moral compass. The story unfolds in two time streams. In the present Smith and Kelsey go to scout out their intended target at a Geek weekend away. The operation goes wrong almost immediately, but rather than run and leave Kelsey behind, he takes her with him to protect her. In the second stream we follow Smith from childhood to his time as a special ops agent and the reason he resigned. Here also we have a character who will do many violent and questionable act, but ultimately walks away from this life over a moral choice. Where Smith is a well-rounded character, as one would expect, Kelsey is a little slopped down on the page with little in regard to the finer details of her character. This is fine as she has very much of a support role. The same can be said of the guys behind the attempted murder. The pace of the book is unrelenting and the writing contains no fat, I read the book in one sitting and would have cheerfully picked up another, if only there had been one. Farnsworth provides a fast, enjoyable thriller with all the elements of the story well balanced. I though the limits he put on Smith were necessary for the book, but also had a ring of truth in its construction. There is little in the way of world building, the setting is contemporary America, and the focus is firmly in character and action. Overall, a highly enjoyable and well written read.